Ten Mile Point near Cadboro Bay in Victoria is an excellent advanced level drift dive, that can be done from shore. Pictures courtesy of Dean Driver, thanks buddy! Accessed from a short but slightly steep and rocky entrance at the foot of White Rock Street in Saanich, this is an amazing dive with no shortage of marine life to see and photograph. It is also a Provincial Marine Ecological Preserve and consequently as divers we are not allowed to take anything but photographs. For some reason though sport fishing is allowed here, so be aware of the potential for discarded fishing line or gear. You definitely want to experience this site if you are a keen cold water diver. Despite the tricky entrance the dive itself is awesome and is not for the inexperienced or faint of heart. After entering the water you can either stay somewhat near the entry point and use that as your exit, or just allow yourself to drift around the bend and about the time the current wanes is where you want to exit. That will be at the foot of Baynes Road where a short walk will get you back to where you started. here during slack water and preferably with little water exchange. Make sure you consult an up to date Tide and Current Guide, or dive with someone who is familiar with the site. The local joke here is that you should carry your passport and ferry money if you dive this site so you can get back to Victoria from whatever American landing you make after getting swept away. Anyway it is a great site, you just have to pick your times. The Ten Mile Point dive site has lots of fish like the great Cabezon, several species of rock fish, and if you look close you might find a Grunt Sculpin or two. Decorated War Bonnets and Octopus can also often be found here! 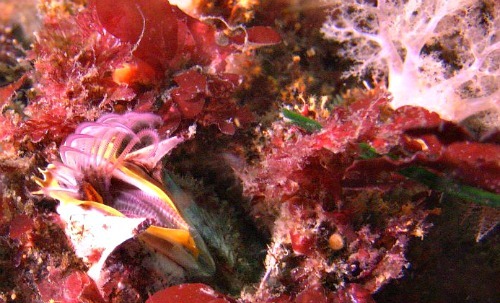 Invertebrates like Giant Barnacles, Plumose Anemones and many other filter feeders are also to be found here. Enjoy and dive safe, cheers. Here are some other pages you might enjoy!